Explanation: It looks like a big space diamond -- but with craters. It's 162173 Ryugu (Dragon's Castle), and Japan's robotic Hayabusa2 mission is now arriving at this near-Earth asteroid. 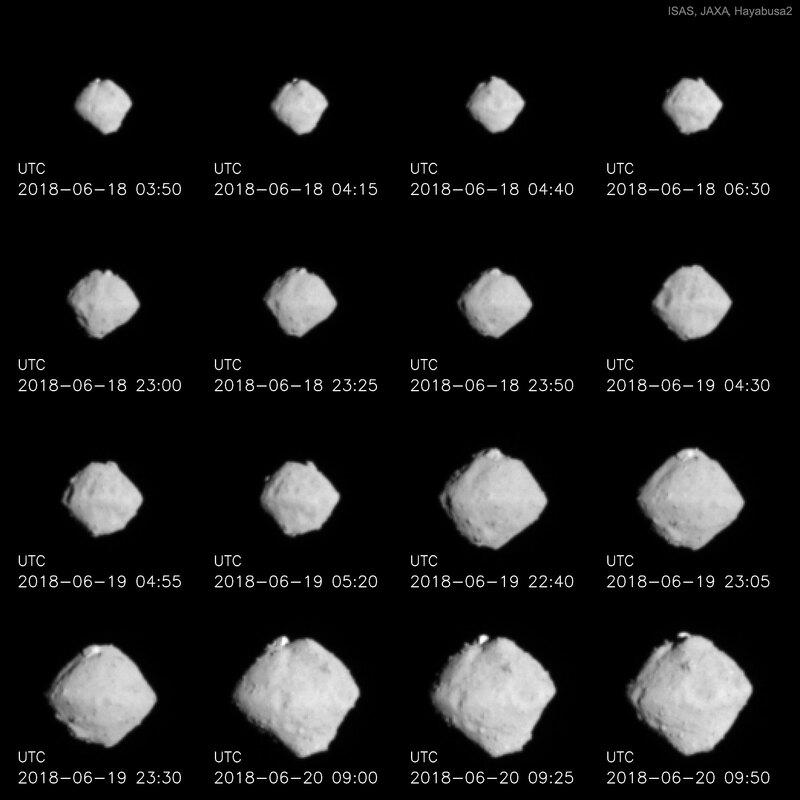 Ambitious Hayabusa2 is carrying an armada of separable probes, including two impactors, four small close-proximity hoverers, three small surface hoppers, and the Mobile Asteroid Surface Scout (MASCOT) which will land, study, and move around on Ryugu's surface. Most of these are equipped with cameras. Moreover, Hayabusa2 itself is scheduled to collect surface samples and return these samples to Earth for a detailed analysis near the end of 2020. Previously, what was known about asteroid Ryugu was its orbit, that it spans about one kilometer, and that it has a dark surface that reflects unusual colors. Studying Ryugu could tell humanity not only about Ryugu's surface and interior, but about what materials were available in the early Solar System for the development of life. Pictured, a series of approach images shows features suggestive of large boulders and craters.